I'm on the lookout for idea's of how to build a transport bike on the cheap. So why not start a thread for posting links, pict and discuss ideas. Here's one I really like, a converted mtb frame with 24" wheels and elongated fork! A bit like the the old butchers type bike! Here's a simple and sturdy front rack made of shelf support rods! BikeRescue in York have been knocking up some Longbikes from old frames this year. They posted a note about it on the Velovision site, and have pictures here. It's something I've been toying with, myself. I reckon using a 20"-wheeled frame for the rear portion (say, a BMX) would give a lower load platform. But I can't work out why no commercial longbike does this. Am I missing something obvious? Thanks for the links PhilO! Funny you should mention it, I spent some time yesterday surfing flickr and found this! Really simple to build as it just bolts together and, like you say, 20" wheels has alot going for them! Here's another that look a lot like the Bike Rescue bike. I don't have access to any brazing tools so I'll probably try a bolt together project like a huge front rack. This cartbike look quite doable too! There's some interesting stuff on that Flickr group - I might have to start visiting it occasionally! I was actually thinking along the lines of a 26" or 700c front end with a 20" rear grafted on. It'd certainly look ...er... distinctive, but I wonder if the handling would be a problem. Specialized used to do a version of the Big Hit with a 24" rear wheel, and I've seen a few 96er and 69er MTBs, so differing wheel size can't be a problem per se. But would an '06er' be a step too far, I wonder? I suppose I'm going to have to find out the hard way, now I've mentioned it, eh? Well, juging by their gallery you have a good source for material if your near Bike rescue! If I get some spare time this winter I really should get going with building a copy of a Bikes-At-Work truss frame trailer so I can transport my kayak . It bolts together and, as far as I can see, the only special tool needed is a conduit pipe bender! Back in the eighties someone (it could have been Jeremy Torr) tried this - he reckoned that it climbed better than a dual-26. I'm watching this thread with great interest as I'm planning on building a rear box for my Moulton APB, which has become my load hauling bike. It's too heavy to be of much use for anything else! The 20" wheels do help, the rear rack is very low and so carrying a large load isn't as scary round corners as it would be if it was 6" higher. The rear box is easy: a plastic crate with an adapter made from metal (two plates, probably) to strap it to the rack. Any ideas for making front panniers? I like the elasticated mesh ones that the Xtra wheel trailer uses, or I might just fit those box panniers they advertise in the back of CTC magazine. I guess you could swap a 26" wheel for a smaller 20" but question remain how to compensate for the slack angles? Don't think even a 24" up front would be enough and then there's the issue of pedals clearing the ground!? Biggsy, is it the Bikebins your thinking of? These seem great for commuting, touring and the weekly grocery run as the lid makes them completely waterproof and doubles as chairs when camping. 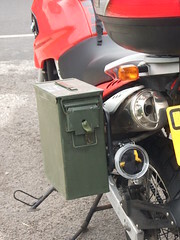 With such rigid panniers you also get a big load space on top to fit larger items like boxes, duffel bags or a basket. But I would prefer some low tech adjustable hooks to better fit various racks! Four of these fitted to my Tubus front and rear rack and I'm pretty much set! Wald still makes these classic bike baskets but I'm not sure how easy they are to come by over here. Giant Wald Delivery Basket on Flickr - Photo Sharing! New Bars For Motobecane on Flickr - Photo Sharing! it fits! on Flickr - Photo Sharing! Work Bike in 1996 on Flickr - Photo Sharing! Here's one of my current projects. The plan is for it to be a hub braked single speed with a huge basket on the back. I made a couple of tough panniers a few months ago, out of these. Weight would be an issue, though! What gearhub did you have in mind? That Nitto stem/moustache combo is a clever and stylish way to sort out that much to short seat to handlebar distance! Are there enough clearance for some comfy Schwalbe Big Apple 2,35"? A small wheel in the back would be a great way of addressing my main grips with the Xtracycle. The high rear rack and lack of room to carry larger items on top! Sure one can fit heavy boxes on the side loaders but that always effect handling. Very nifty MC boxes but could use a touch of Testarossa red! Got any 50 cal ammo left for new years eve btw? I was planning on fitting big apples originally, but I think the forks may be too narrow. The rear hub will be the Sturmey XRD with a single speed sprocket. The frame needs a few modifications before any of the above can take place tho'. Maybe you can find some creme colored touring tires that fits. But with that great finish I hope your not chopin the frame up! The finish isn't as good as the photo suggests unfortunately. The modifications I've got planned are more modernization than anything else, the spacing on the forks and the rear triangle needs increasing slightly to take modern hubs. And the dropouts themselves are slightly too narrow for modern axles at 9mm. They'll need filing out. The big mod will be to sort out the obsolete threading in the b/b shell. Fortunately the b/b shell is quite wide, so trimming it down to 68mm and re threading shouldn't be a problem. Cool! Would be great to see the final buil! PhilO, check out this new affordable longbike! Incorporates the idea of big wheel up front and small in the rear and seem to caused quite a stir. The larger front wheel will corner better and with the weight of the rider up front it's less likely to washout. Makes a lot of sense when riding in all year round! 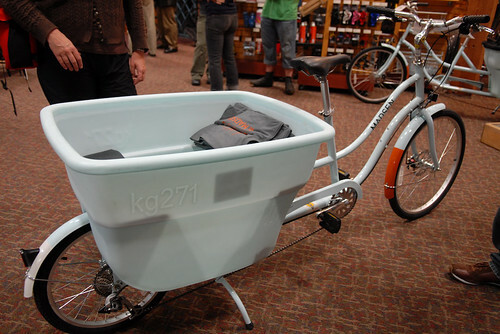 Madsen Cycles - Bicycles for utility, cargo and transportation. Cargo bike Bullitt ® by Larry vs Harry cargo bikes, Copenhagen. Aye, that's just the kind of thing I had in mind! Add an electric drive for the hills round here, and Ojnr's transport to nursery is sorted! 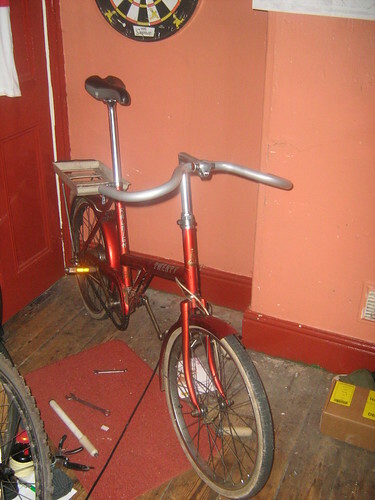 If anybody is near Portsmouth this tandem on Ebay looks like it would be an easy conversion. Just what I was thinking when I wrote my earlier post. Dual purpose tandem and cargo bike! Has there ever been such product? It's like when I first saw a Hase Pino years ago and was surprised how similar the construction was to that of the Filibus. Two versions are made by Fietsfabriek and Kemper but like the Pino they still cost an arm and a limb! I'd like both a Pino and Filibus but not prepared to spend that kind of cach for something such large to fit in to my apartment and with a limited usage. Now, if someone come up with a bike that had both features at a decent price i would be first in line! If your after a electric engine check out the Stokemonkey from Clever Cycles. Sale seem to be on hold at the moment but it has some nice features. Surely, you could just strap a box to the seat of a Pino, or make a load platform to bolt on in the seat's place? Removing the boom and front chain would be trivial, or it could just be left in place. Re the bottom bracket. If you google the raleigh twenty sites you should soon hit a dutch guy whose found a sealed unit size that fits the twenty. This challenges Sheldon, who suggetsed the only soloution was an expensive phil woods bodge. And it sold for only £51... Anybody here?